My writing is loud in the silence. Take away a continuous musical score from a dance work and your internal soundscape takes over. The atmosphere becomes dense with micro-sound - ears hum, breathing becomes explicit. We are being primed to listen and notice. KAGE's new work, Out of Earshot seeks to adjust perspective in terms of how the hearing perceive sound, to invent ways for the deaf to experience sound and for both to experiment with different sensory pathways into understanding silence and noise. Choreographed collaboratively under the direction of Kate Denborough, Out of Earshot features five performers (Elle Evangelista, Myele Manzanza, Anna Seymour, Timothy Ohl and Gerard Van Dyck) whose dance, rhythm and drumming create a visual and auditory language for conveying a set range of emotions - passion, empathy, exhilaration and intimacy. The design adds further elements for visualising sound - three light panels act to both modulate the mood throughout the performance through changes of colour and to visually represent the tone and urgency of the music via the spikes, jabs and wobbles of a sound-frequency monitor display. Starting in silence, the opening section of the work has dancers patting out light rhythms, hands softly drumming against flesh. A series of holds and transfers allows for a variety of bodily surfaces to be used to drum out the rhythmic patterns. A drummer (Myele Manzanza) choreographs rhythms into the floor before taking to his instrument. A central drum kit then becomes the site for the creation of the sound, the music now more intense. Throughout the performance, close contact is maintained between dancers who often work in pairs. 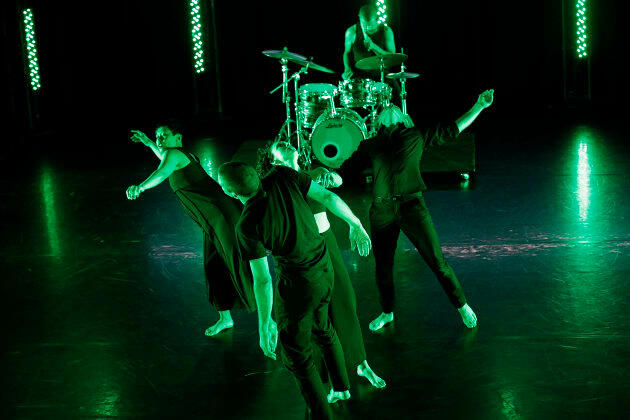 The percussive quality of the drum score is echoed in the bodies of the dancers as they slam, jar, fall, support one another's weight and start and end phrases abruptly. Traditionally melodious music is absent here and so largely is the fluid movement that often accompanies it. The performers were all terrific, athletic and subtle and Manzanza was as much of a dancer as the other cast members as he described sound with his body even as he played it. Although explicitly engaging with ideas of visible sound and notions of hearing and non-hearing, Out of Earshot didn't feel to be just about the absence or presence of sound but rather the multiple ways that humans understand and communicate. Out of Earshot is a rich collaboration between the hearing and deaf, the visual and tactile and the emotions of being human. Out of Earshot plays Chunky Move Studio until 10 June. Drummer Myele Manzanza was as much of a dancer as the other performers. Photo: Jeff Busby.